Map maker : DUFOUR, A.H.. Date : Paris, Jules Renouard, ca.1840. Size : 9.1 x 14.6 inches. / 23.0 x 37.0 cm. Description :Finely engraved Uranography plate with an armillary sphere in the center. 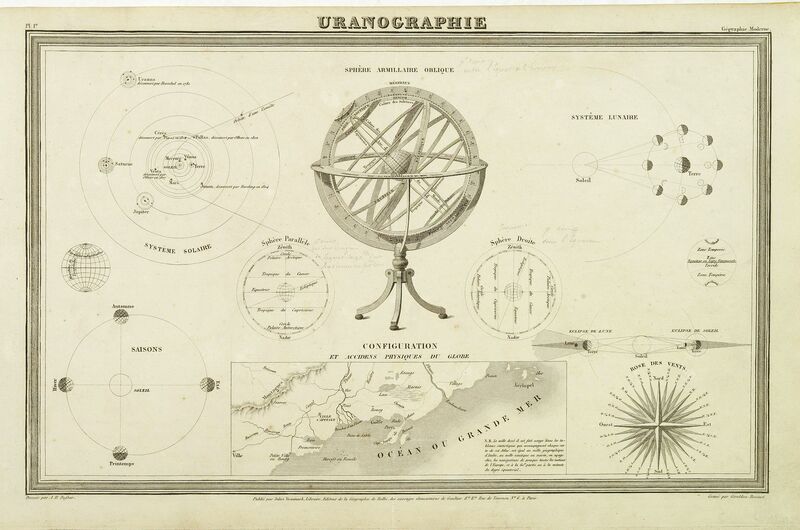 Uranography is the branch of astronomy concerned with mapping the stars, galaxies, or other celestial bodies. prepared by A.H.Dufour and engraved by Giraldon-Bovinet. Published by Jules Renouard in his uncommon atlas "Le globe Atlas classique Universel de géographie ancienne et moderne, pour servir a l'étude de la géographie et de l'histoire dressé par M. A.H.Dufour, Et revu par M.Jomard". Jules Renouard was a publisher, active at 6 Rue de Tournon, Paris. A line in bottom part informs the reader that Jules Renouard was the editor of "La Géographie de Balbi". Afterwards the company was called "Jules Renouard et Cie" and known for his plans and panoramas of Paris. The business was continued by his widow. Condition : Steel engraving. In very good condition.